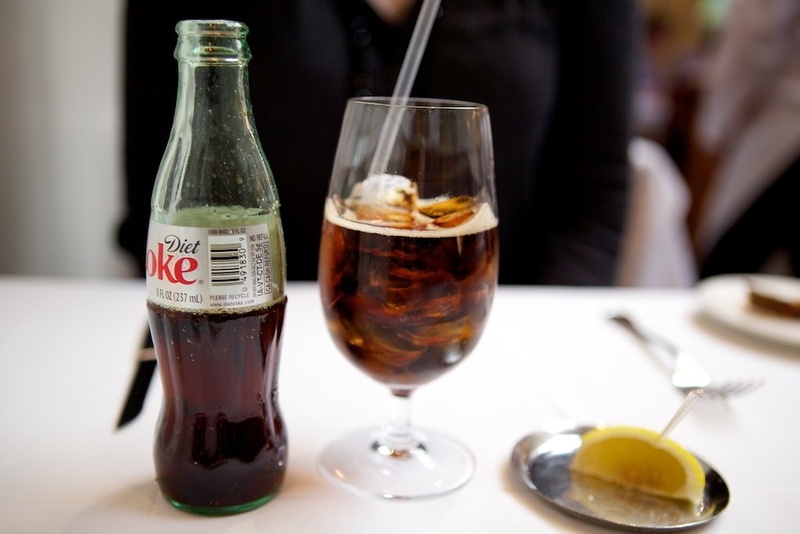 … and the Diet Coke comes with the lemon wedge on a silver tray. 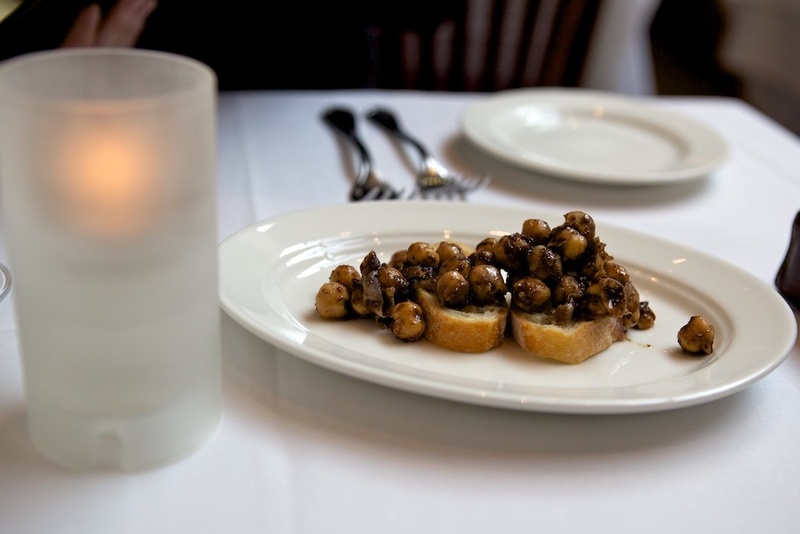 Here’s Babbo’s amuse bouche — a slice of bread with balsamic-marinated chick peas. I wouldn’t normally think of chick peas at an Italian restaurant, but this was delicious — if not particularly dainty. 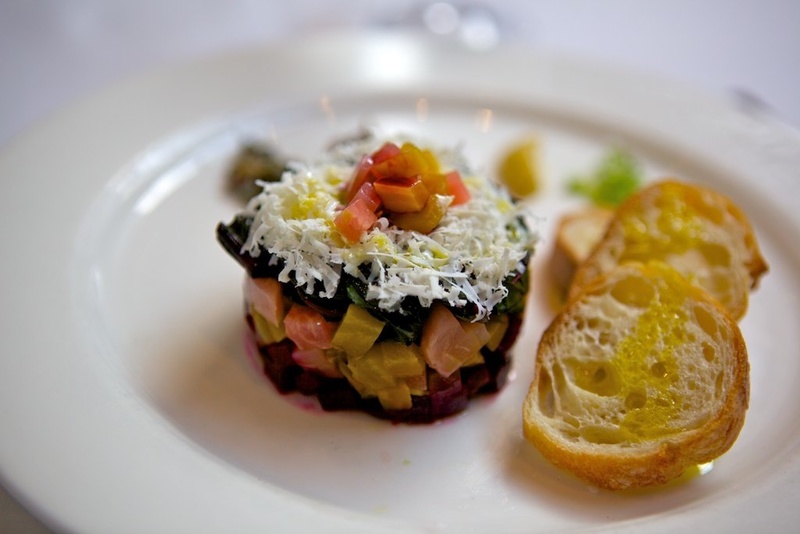 Dinner at Babbo is not a “light meal,” as you’ll see. 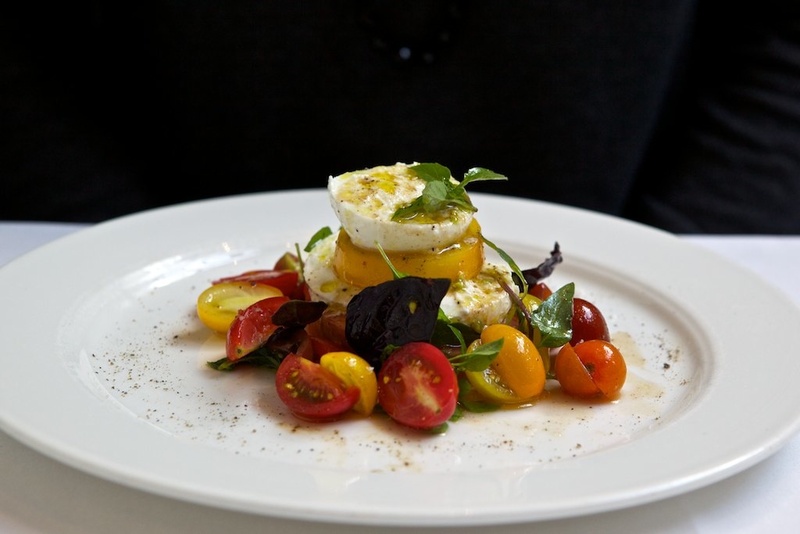 As she did at any restaurant where it was offered, AEJ started with the tomato special — these fresh, heirloom tomatoes with basil, olive oil, and fresh mozzarella. We split a pasta course. 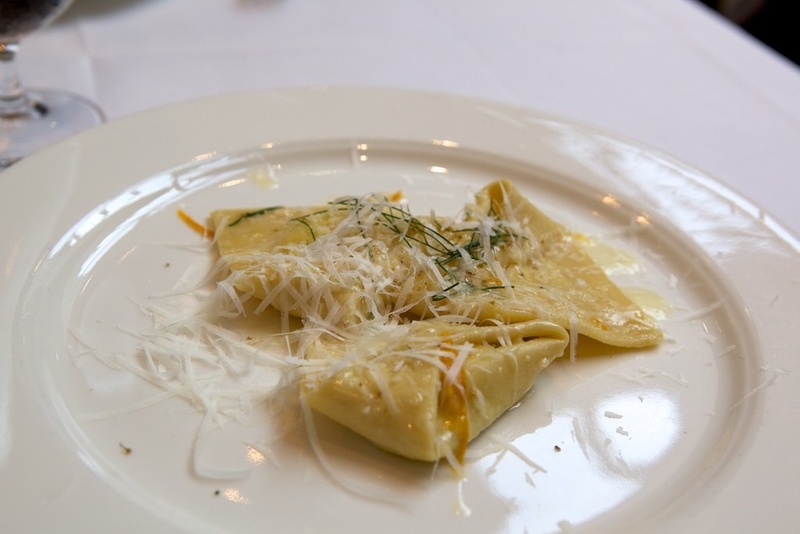 This is goat cheese tortelloni with dried orange and wild fennel pollen. The combination of creamy goat cheese with the brightness and acidity of the orange was fantastic. 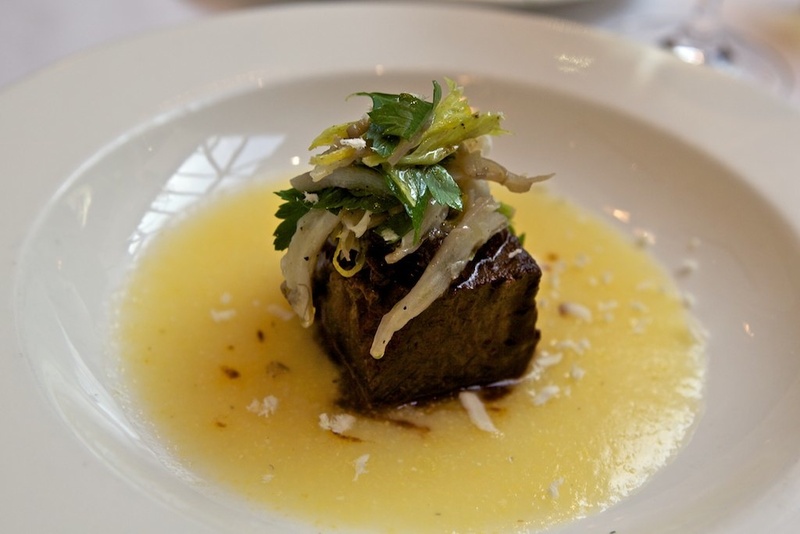 For my main course, I had the braised beef. It looked small — it was probably a 2″-square — but lordy, that was plenty when the richness was this far off the charts. Delicious. 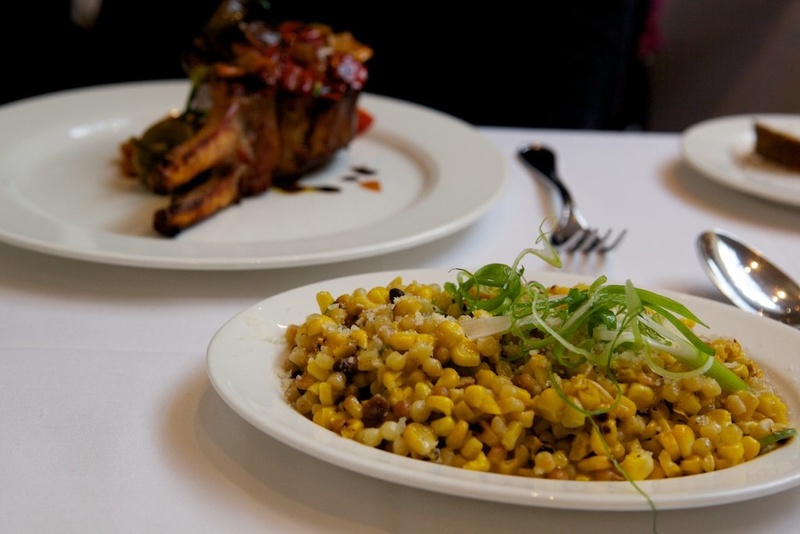 This fresh roasted corn side dish was incredible. There was a very dry, tart cheese mixed in, but I can’t for the life of me remember what kind of cheese it was. But wow, this was good. 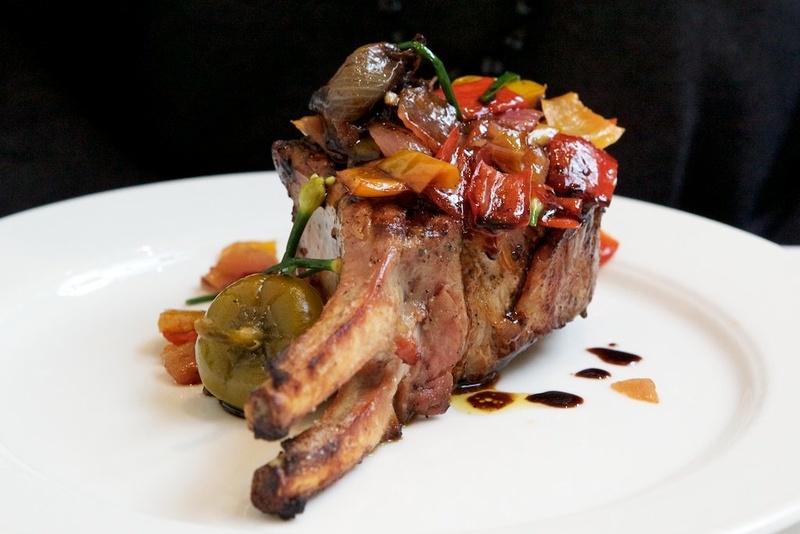 And this is AEJ’s main course — a grilled pork chop with cherry peppers (oh man, those ruled), cipolline, and aceto manodori. I don’t think the photo truly captures the massive size of this Flintstonesque hunk of pork. After she finished dinner, I was so inspired by her dish that I hit AEJ over the head with my club and dragged her back to my cave. Coffee? 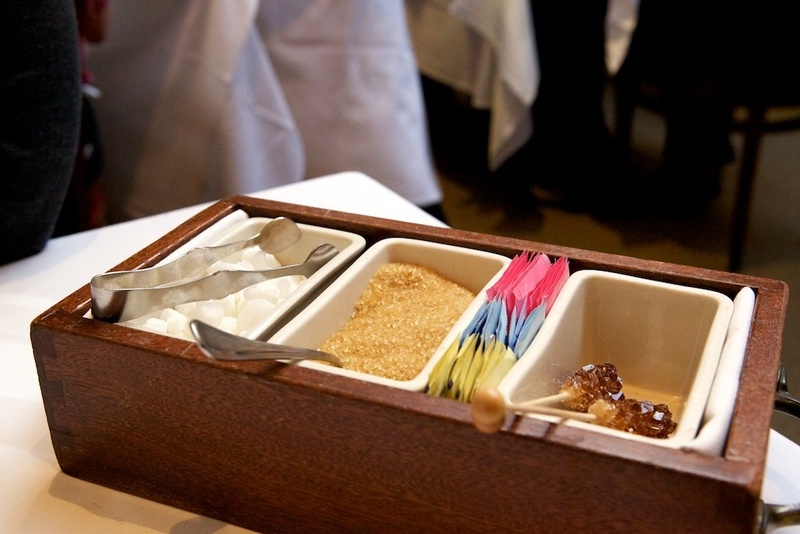 Why not — especially when you get this fun sugar box with it! 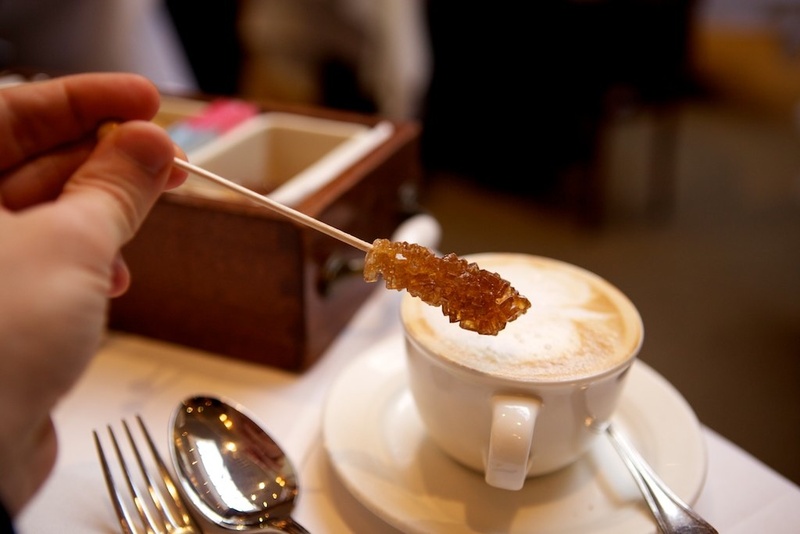 I sweetened mine with this raw sugar stick. My dessert was the best dessert I had all summer — and I’d had some doozies of delicious. 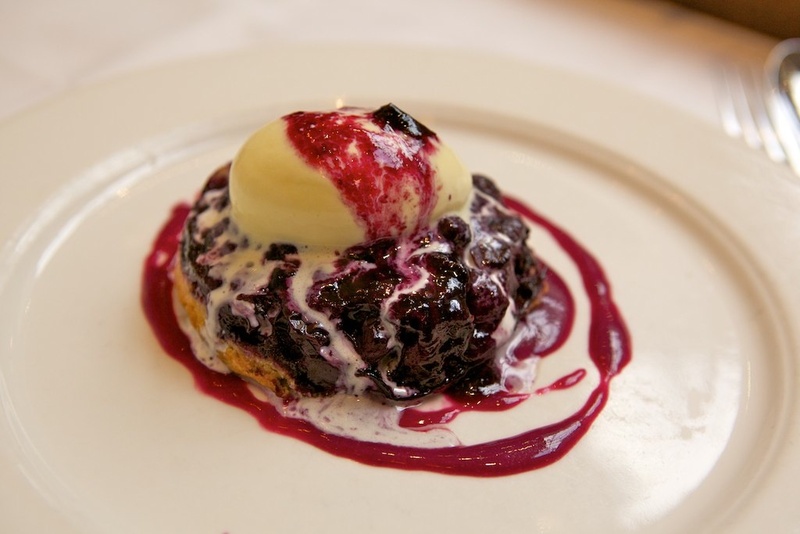 This is blueberry almond cake “Sottosopra” with toasted almond gelato. Good christ, it was amazing. AEJ went with the homemade strawberry ice cream. 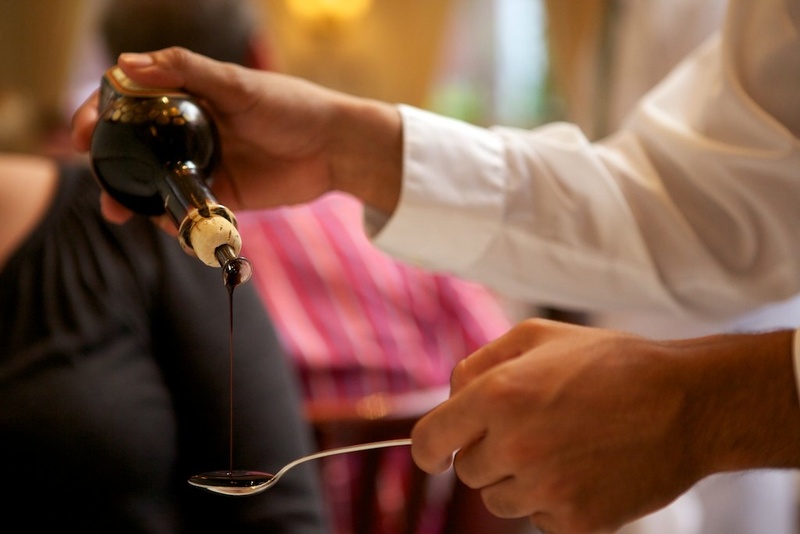 For an upcharge that would make you think they were offering an optional spoonful of liquid gold, you could add this aged balsamic (was it 30 year? 50 year? I don’t remember for sure…). It was like thick chocolate syrup. For the price, I thought he was going to leave that bottle, but all we got was a spoonful. Turned out, as rich as it was, that a spoonful was all we needed. 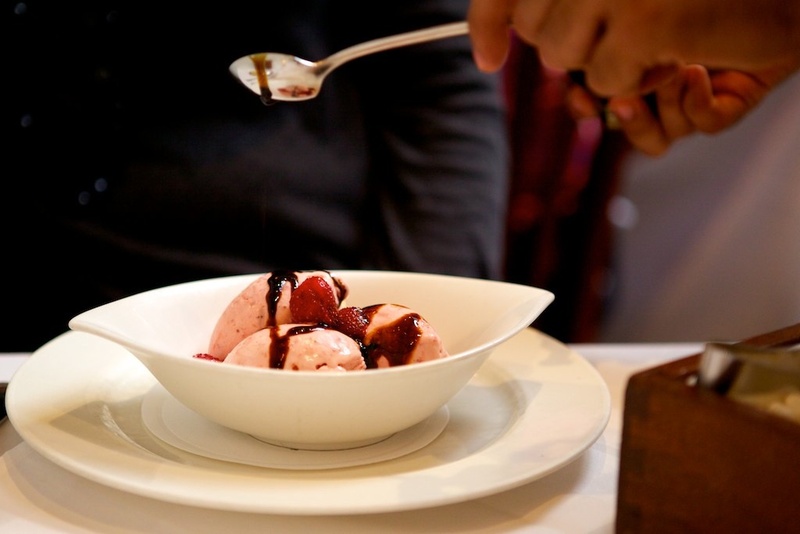 The balsamic was insanely great on the strawberry ice cream. Why have chocolate sauce when you can have balsamic vinegar? 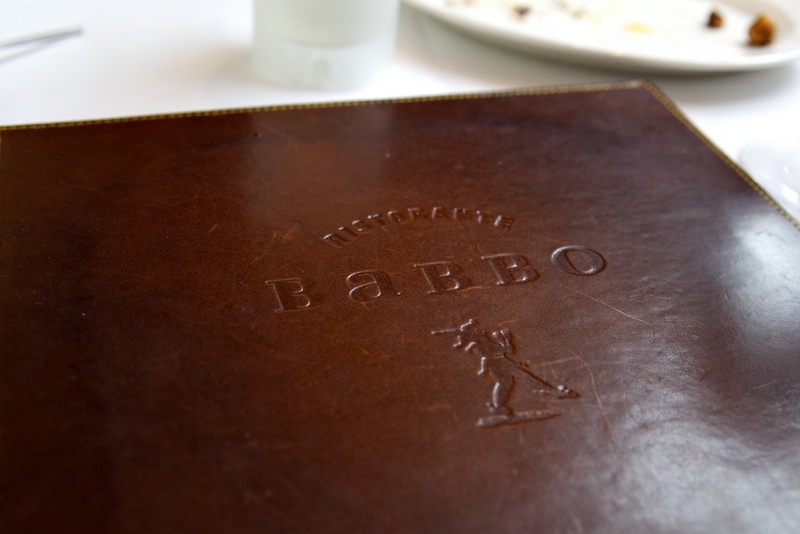 Whereas WD-50 and Eleven Madison Park had been all about modern innovation, Babbo is straight-up yum. 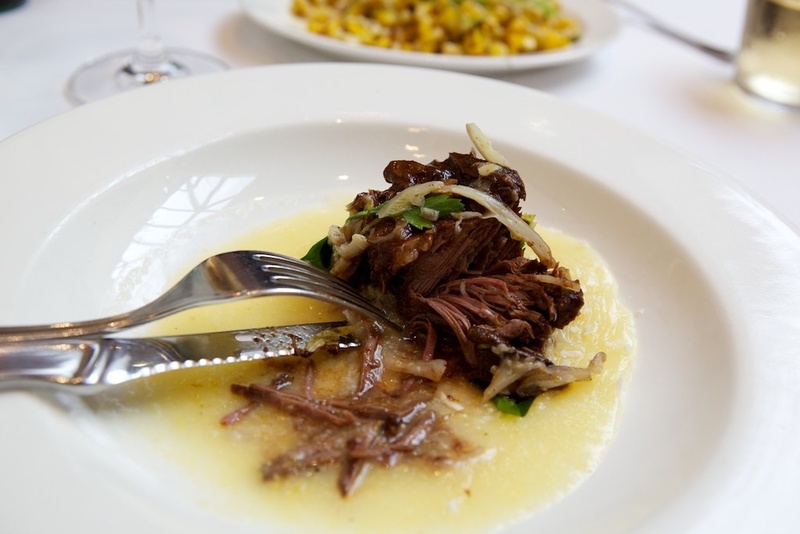 There’s no foam or sous vide or liquid nitrogen — there are just perfect, fresh ingredients and masterful preparation. I love a frozen tomato lollipop as much as the next guy, but sometimes it’s nice to just have an unadulterated, fresh tomato. Nom. after reading “Heat”, I’ve always been curious about Babbo. Thanks for the tour JM. You owe me a new Macbook as this post made me eat my laptop monitor. Those pics are amazing, John–what are you using to take the pix? And your wife’s chop was drool worthy! Mitch, those were all shot using the Canon 5D Mk II with a 24-70mm f/2.8L. The full list of camera equipment is here.